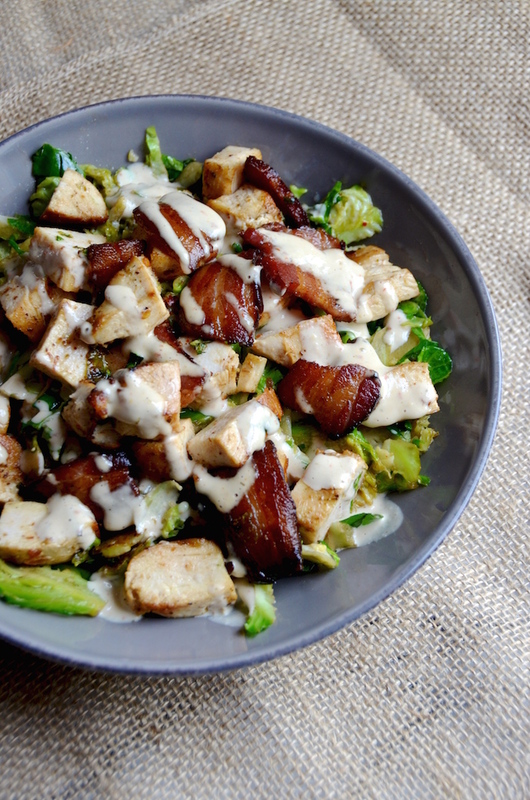 Warm Brussels Sprouts Caesar Salad with Chicken and Crispy Bacon "Croutons"
I was at lunch with an old friend when I spotted the dish that inspired this salad recipe. It was on the appetizer menu and listed as a Warm Brussels Sprouts Caesar Salad. My friend was talking and I was pretending to listen, but in my brain I was just like YES YES YES! Everything about that sounded amazing to me. Here's the thing: I'm in love with recipes made with shredded Brussels sprouts, like this breakfast hash and this tangy side salad. AND I've always been a Caesar salad fan (I mean come on...who isn't?). BUT, I don't love romaine lettuce. I barely like it, actually. I always think that half of it is too soft and the other half is too crisp. And none of it has any sort of particularly interesting flavor. Bleh. Boring. I don't know who decided romaine should be the go-to match for the creamy, tangy dressing. People either overdress it so the tender leaves are all weighed down, or they're super light and then you just have crunchy blah lettuce with not-enough dressing. Total lameness. 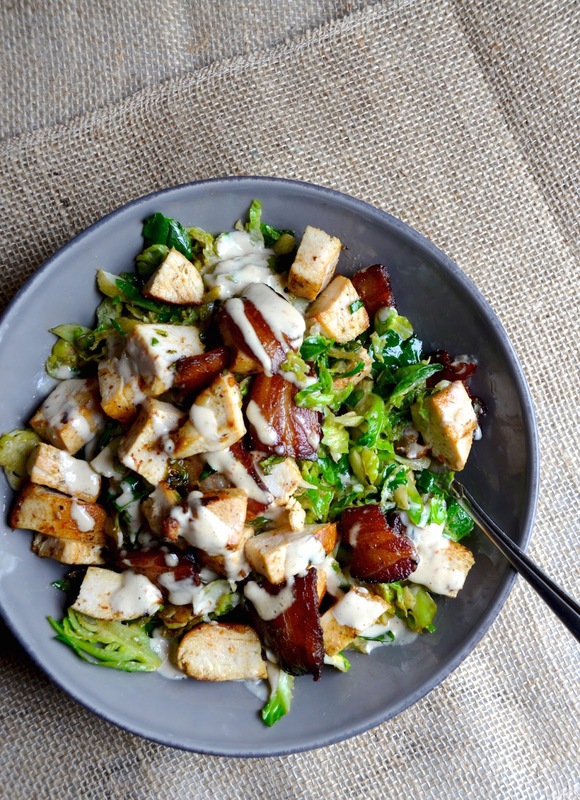 Kale works beautifully with Caesar dressing and has been my go-to for a couple years, but now I know that thinly shredded Brussels sprouts are even better. And when served warm after a quick saute? Hell, yes...Perfection! I wanted to turn the idea into a complete meal, hence the addition of pan-seared herbed chicken breast and thick and crispy squares of bacon. The bacon takes the place of the typical croutons for a low-carb, gluten-free alternative. Yay! If you want to buy your dressing, do it. The cool part about this recipe is the technique. But just know that homemade Caesar dressing is very easy to make and can be easily adjusted according to your preferences. Though typically made using oil and egg, I love the cheat of using a few scoops of store-bought mayonnaise. It's the same ingredients, but saves you a step (and is more appealing to those who are squeamish about raw egg yolks). Anchovies are key to a proper Caesar dressing so don't you dare try and skip them! Make the dressing: Combine all dressing ingredients in a blender or food processor, and puree until smooth. Set aside. Make the chicken: Place chicken in a bowl and add the olive oil, lemon juice, garlic, oregano, salt, and black pepper. Toss to coat well. Heat a skillet over medium-high heat. Add olive oil to coat the bottom of the pan, then add the chicken breasts in an even layer. Cook about 4 minutes, or until golden and crisp on the bottom. Turn over and cook for another 5 minutes, or until golden and cooked through. Transfer to a separate platter and cut into strips or cubes. Lower heat to medium and add another tablespoon of oil to the skillet and add the bacon pieces. Cook until crisp. Remove with a slotted spoon and add to the platter with the chicken. Raise the heat to medium-high and add the shredded brussels sprouts to the skillet. Saute in the bacon fat for 3-4 minutes, just until the sprouts wilt slightly. While still in the skillet, add in a few tablespoons of dressing and toss to coat evenly. Add the chicken and bacon back in and toss again. Divide into bowls and drizzle with additional dressing before serving.